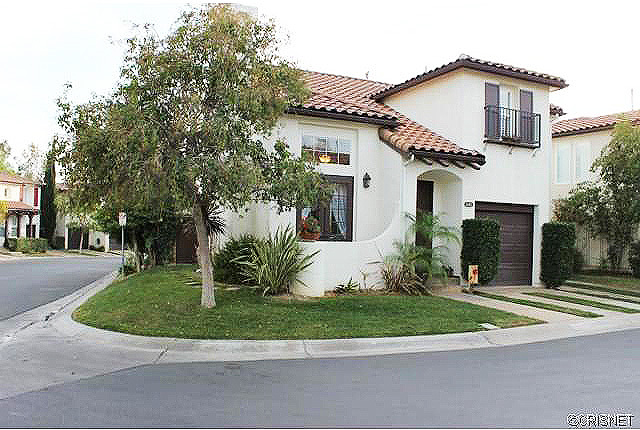 What a beautiful 2-story 3 bedroom, 2.5 bath home in the Shutters tract of Valencia Northpark Community. Corner lot location with nice sized rear and side yards featuring paver stone and water fountain. French doors from living room to front romantic patio. Home features Pergo type flooring and tile floors throughout. Shutters on every window, ceiling fans in each bedroom, over-sized open floor-plan kitchen with island, newer stainless steel stove, microwave and dishwasher. Entertainers dining area, computer niche with French door entry to rear yard, vaulted living room ceilings with fireplace, direct garage access through kitchen. All bedrooms are upstairs, Hall bathroom recently remodeled. Intimate Master bedroom with recently remodeled master bath with large walk-in closet. You can show this home cold, it will knock your clients socks off! Wonderful Northpark Community features pools, spa, parks tennis courts and pride of ownership.